This is a close-up shot of a butterfly bush bloom that’s just starting to open up. This bloom is a pinkish purple color. Another butterfly bush bloom in the back yard. This one is the more traditional dark purple color. A beautiful Phlox with a violet colored bloom. Another Phlox with a dark red bloom. Gorgeous! A hibiscus bloom is part of a four tree cluster in our back yard. Two trees bloom in pink and two trees bloom in white. Hibiscus blooms ready to explode into a beautiful pink display. Chicken and hens in the growing phase. See the little chicks just starting to poke their heads out of the ground. In the front yard now. Here are some blooms of Astilbe ‘Chinensis Pumila’. A dragonfly resting on the dark purple bloom of a butterfly bush. 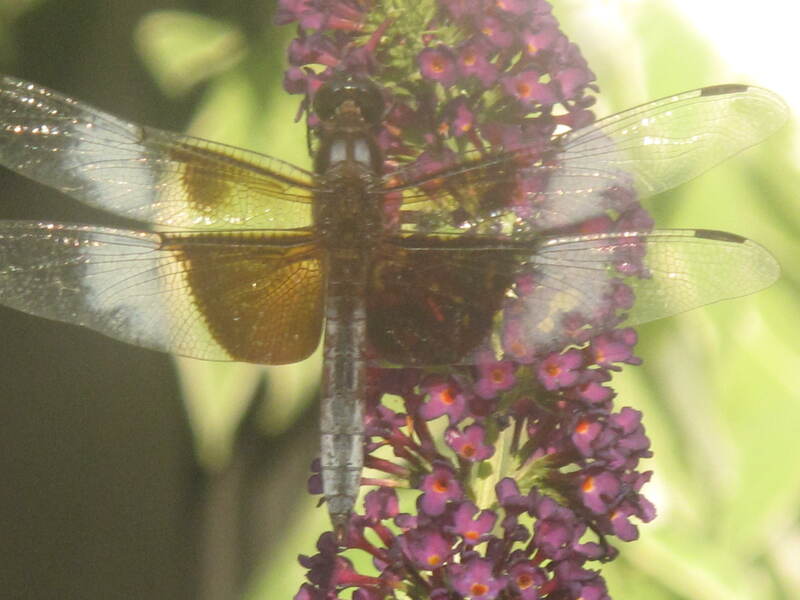 Another shot of the dragonfly on the butterfly bush. Where are the butterflies? Do we need to rename this to a dragonfly bush? Echinaceas in all colors. Here is a light pink one. A coconut lime echinacea is also in bloom. A fuschia bloom of echinacea. Almost looks electric it is so bright. A pair of coconut lime echinacea. The Monarda are still hanging in there after blooming almost three weeks ago. A tough Summer bloom. We hope you liked our little virtual garden tour. It is amazing that there can be so many blooms given the temperatures we have been dealing with here in Connecticut. It just goes to show you that there is always a flower of some sort for every season. All of the plants in this tour require very little water and still show off a dynamic and beautiful display of blooms. What, if anything, is blooming in your neck of the woods given the hot temperatures we have been having? This entry was posted in Nature, The Garden-2011 and tagged Acorns, Beauty, Blog, Entertainment, Fun, Gardening, Life, Lifestyle, Love, My Life, Nature, Photos, Summer, Thoughts. Bookmark the permalink. ← A Toad’s House Or Did We Buy Some Bad Real Estate? Love the picture of the dragonfly! Hopefully the plants love hot and humid. I myself am wilting in this brutal heat. Hi Dianna. I agree, it’s pretty hot. I don’t get out much in weather like this. Even watering the plants is an effort in this humidity. Just make sure you keep hydrated…booze doesn’t count. 🙂 Come back and visit soon. Great shot! Oh if only it were only in the low 90s here…. Stay indoors with the rest of us. That or risk your hair catching on fire. It is hot and humid all over the U.S. Thanks for the comment. Hello, this is my first visit to your blog. I’ve been putting together a nature photo blog of my own and I have to say I love the pictures you’re sharing. I’m also learning a lot. I don’t know the proper names of most of the flowers I’m photographing as I’m rolling through the neighborhood and parks, but I see some familiar ones on your blog. Thanks for sharing your lovely photographs. Hi and thanks for your comment. I’m glad you enjoy the blog and the pictures. I really love doing it. I think it really makes me appreciate and take notice of life more than if I wasn’t doing it. We are always up to something here on Acorns On Glen. Come back and visit soon. Such beautiful flowers. I have been at Glen Road many different seasons and there is always something of beauty. This includes winter. Always a beautiful patch of green somewhere in the snow. Thanks for the comment Carolkin. So hot here now I’m not sure how anything blooms. Come back and visit soon.